The fossil record, although commonly presented as evidence for evolution, actually attests to the falsity of the evolution hypothesis. An embarrassment to Charles Darwin, the fossil record is now unabashedly preached as evidentiary for evolution. In analyzing purported transitional species, it is obvious that the degree of genetic variability inherent in all species is not considered in the interpretation of fossils as it applies to evolution. This is an alarming omission, given the fact that profound variability has been scientifically documented to exist. 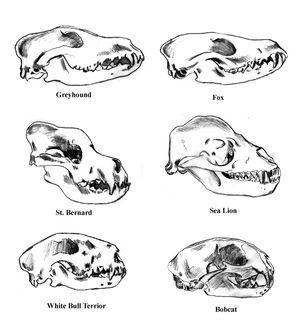 Note that a greyhound skull and a fox skull are nearly identical. Yet they represent distinct, reproductively isolated species. Suppose a greyhound skull and a St. Bernard skull were found, along with a fox skull. Utilizing standards of modern paleontology, which two of the three skulls would be classified as one species? A white bull terrior skull has more similarities with the skulls of modern cats than it does with other dog breeds that are representative of the same species.